11.25 metres of macrame rope in 5mm thickness. I used Bobbiny macrame rope. For those using our plant hanger kit, cut your length of rope into four equal lengths. Or cut four lengths of macrame rope each 110" long. Thread them through the wooden ring, bringing the ends to meet so the wooden ring is in the centre. Take one of the large 10mm hole size wooden beads and thread all the rope ends through it. Push the bead right up to the wooden ring. It helps to twist it as you push it up. Divide the eight ends out into four pairs. Add one of the smaller wooden beads to each pair of ends, 8" down from the large wooden bead. Tie a knot under each of the beads to secure it in place. You have probably been tying this basic knot your entire life and not known its name. Apparently it's called an overhand knot (steps 1 and 2) and I doubled it up (steps 3 and 4). I'll call this a double knot for the rest of the tutorial. 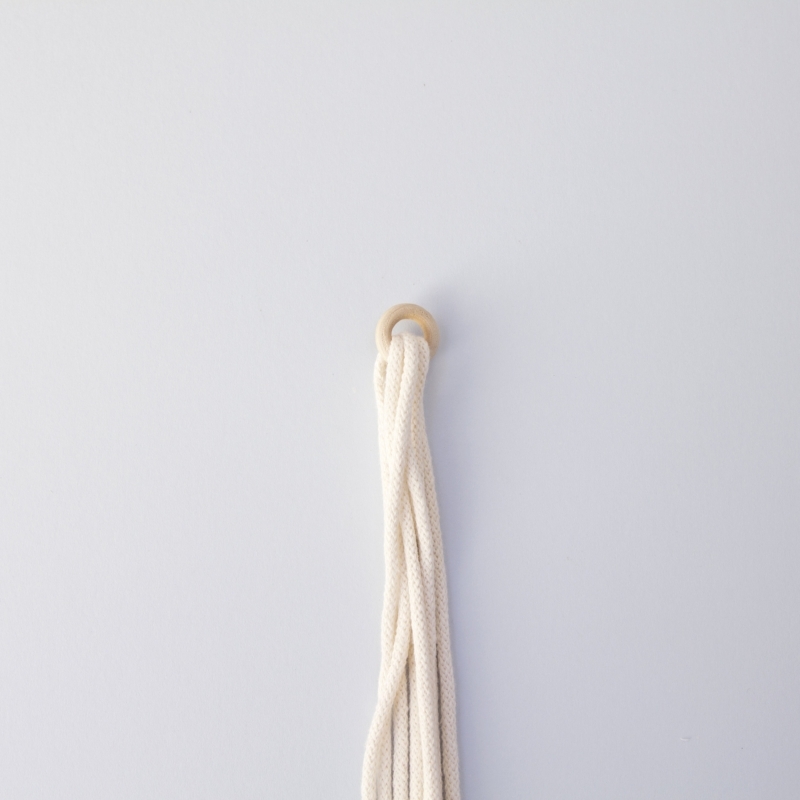 Your plant hanger should now look like this, ready for its plant friend! To pop your plant pot inside the hanger I find it easiest to remove the plant and turn the pot upside down. Place the large bead in the middle of the pot base and arrange the four pairs of strands as in the image below. Here it is! A little touch of macrame in my living room and a lovely new home for my new favourite plant.